There is a real demand for a tech-savvy workforce to support high-skill, high-wage jobs. The right education and training will provide men and women a rewarding, well-paying career that generates and delivers power to millions of people every day. Governor Inslee and Mayors within Washington signed proclamations to increase awareness of rewarding careers and training opportunities within energy. 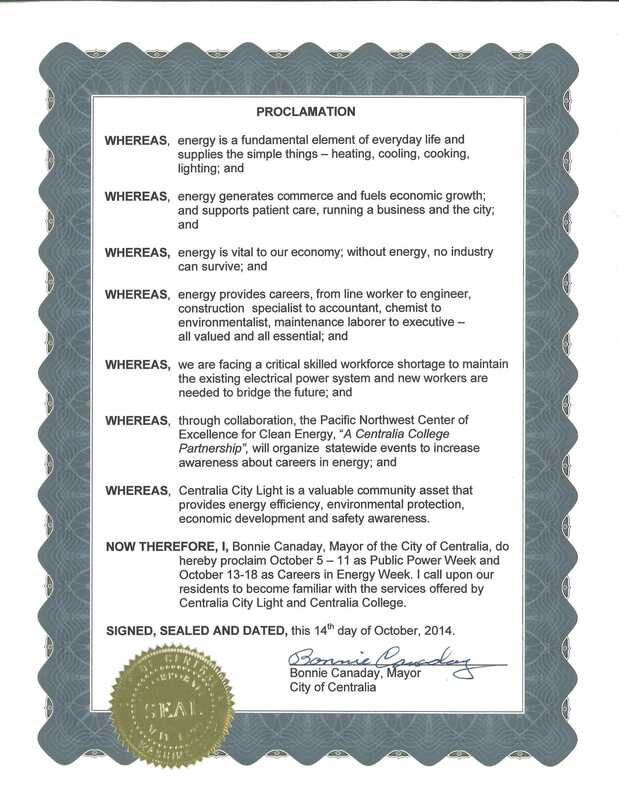 For the fourth year, the Pacific Northwest Center of Excellence for Clean Energy (PNCECE), a Centralia College partnership, and the Washington State Labor Council coordinated statewide events that supported a national initiative to promote high-skill high-wage energy careers. Careers in Energy Week, which was held Oct. 13 – 18, reached more than 4,283 students, parents, teachers, counselors and veterans in 19 various activities throughout the state. Teachers became apprentices for the day at Avista’s Jack Stewart Training Center in Spokane; an afterschool meet and greet was held at Spokane Valley Tech; and utility employees, such as Tacoma Power and Lewis County PUD, participated in career fairs throughout the state. The week offered an opportunity to reach out to K-20 students, faculty and parents about the energy industry and great careers it provides. It’s not an industry that students immediately think of when planning their futures (Centralia College graduates have earned $15 – $36 an hour in their first energy-related job – which may include an apprenticeship program). 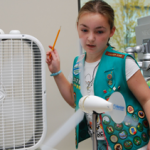 Most energy-related jobs require an understanding of science, technology, engineering and math. Careers in Energy Poster for high school counselors. Contact us for free posters. Interested in promoting your Careers in Energy Week activity? Contact Barbara Hins-Turner for more information.